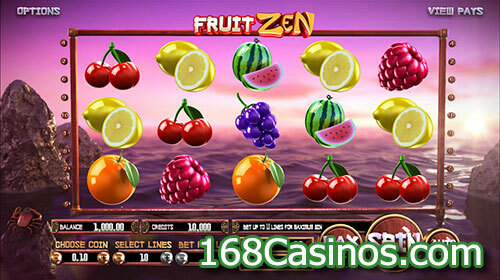 Fruit Zen Slot is one such online video slot from the house of Betsoft and like the theme of the slot, its visual appeal is equally enticing thanks to the finely created visual using abstract three dimensional inputs that will definitely bring water into your mouth. The whole screen looks like to be the eye candy with lots of fruits inside the reel matrix and background which is long sea view and bottom area is where all the navigational options reside with a delicate appearance on the screen. This is precisely a five reels online slot that offers as many as ten paylines wagering option and unlike other slots of its genre House edge over here is mare 4.04% which is too low considering the look and feel of the game. Anyways, if you are convinced with its audio visuals and offerings it has in store for you and want to play it for real money than have a look at its wagering requirements to find out any hidden drawback of the game. Being a penny slot, its wagering is not too harsh on player bankroll; in fact, anyone can start rolling the reels with as low as ten cents coin which can be as high as fifty cents and you can maximum wager ten coins per line to make your highest bet to the tune of 100 coins only. If this is something within your budget then start picking the base options like paylines you want to wager your money upon, coins, and their value. Once done, hit the Spin and reels will start rolling to offer your landing screen in few seconds. You will be notified instantly if there is anything to take home else start the whole process again. 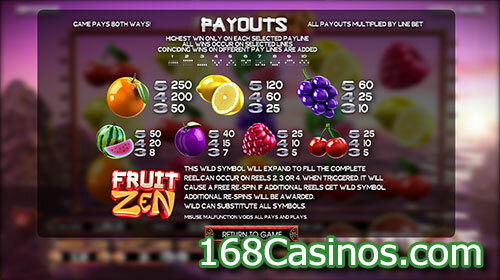 Since this is only a ten paylines slot, many players would find it not up to their taste but be noted this game pays in both left to right and right to left directors that effectively makes it a twenty paylines slot. Likewise, there is a wild symbol which is the Fruit Zen logo and can only land on 2, 3, and 4 reels only but its feature is that it will expand to cover the whole reel in flowers every time it shows up. Likewise, if you have another wild on the landing screen, it will also expand and both wilds will stay sticky for one more re-spin. Taking together all the bonuses, maximum re-spins you can get is three if you get three wilds on the middle of the five reels.